You&apos;ll be awed by this high quality custom-built home situated on 3.13 acres and priced BELOW tax appraisal! It is located at the end of a cul-de-sac in the beautiful subdivision of Westgate near Rutherfordton. With almost 4000 square feet, there&apos;s 4 BRs, 4.5 BAs, large Living room with cathedral ceiling & stone fireplace, Formal Dining Rm., Custom kitchen w/breakfast area, laundry room w/pantry, a library, an office, plus a bonus room! Gourmet kitchen has cherry cabinets, granite countertops, stainless appliances including Viking Professional Series 6-burner gas cooktop, double convection ovens, and a steam oven with warming drawer. Butler&apos;s pantry has wet bar and wine cooler. Master suite on main floor has trey ceiling, two walk-in closets, large bath w/double vanity, slate shower & Kohler antique claw foot tub. Floors are Brazilian cherry with laundry rm. & baths having marble or ceramic tile floors. The bonus room over the garage has walk-in closet and bath which makes for great guest quarters. Covered porches on front & back are great for enjoying the wooded backyard or the beautiful landscaping. There is a double garage, an insulated 12X28 storage building with electric, and a basement area that&apos;s great for a workshop! Home also has "Leaf Relief" on gutters, commercial downspouts, trex decking, Rinnai hot water heater, & a sprinkler system. A home warranty is included and there is a termite contract with Goforth Pest Control. Great location near Rutherfordton but outside city limits. Only 20 minutes to the Tryon International Equestrian Center or beautiful Lake Lure! Feature Remarks: Southern Splendor! 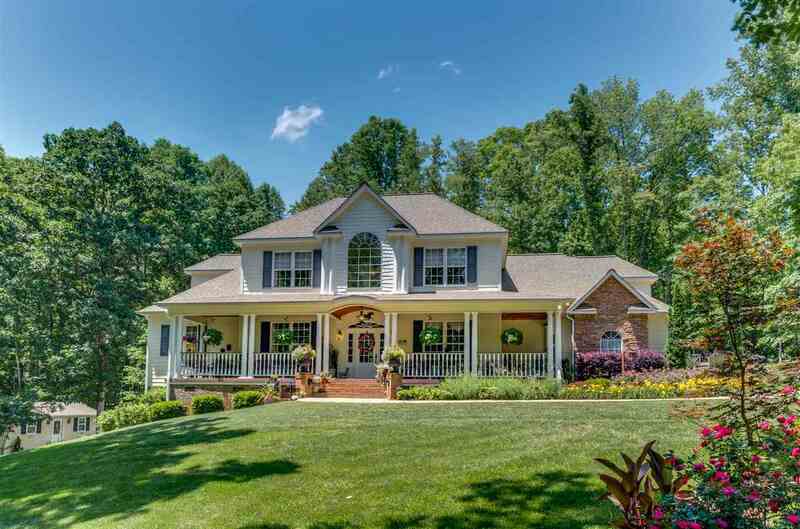 High Quality Custom-Built Home Situated On 3.13 Acres At End Of Cul-De-Sac In Beautiful Subdivision Near Rutherfordton. With Almost 4000 Square Feet, There&apos;s 4 Brs, 4.5 Bas, Large Living Room With Cathedral Ceiling & Stone Fireplace, Formal Dining Rm., Custom Kitchen W/Breakfast Area, Laundry Room W/Pantry, A Library, An Office, Plus A Bonus Room! Gourmet Kitchen Has Cherry Cabinets, Granite Countertops, Stainless Appliances Including Viking Professional Series 6-Burner Gas Cooktop, Double Convection Ovens, And A Steam Oven With Warming Drawer. Butler&apos;s Pantry Has Wet Bar And Wine Cooler. Master Suite On Main Floor Has Trey Ceiling, Two Walk-In Closets, Large Bath W/Double Vanity, Slate Shower & Kohler Antique Claw Foot Tub. Floors Are Brazilian Cherry With Baths Having Marble Or Ceramic Tile Floors. The Bonus Room Over The Garage Has Walk-In Closet And Bath. Covered Porches On Front & Back Exuberates The Enjoyment Of The Wooded Areas And Beautiful Landscaping. There Is A Double Garage, An Insulated 12x28 Storage Building With Electric, And A Basement Area That&apos;s Great For A Workshop! Home Also Has "leaf Relief" On Gutters, Commercial Downspouts, Trex Decking, Rinnai Hot Water Heater, & A Sprinkler System. A Home Warranty Is Included. Great Location Near Rutherfordton But Outside City Limits. Only 20 Minutes To The Tryon International Equestrian Center Or Beautiful Lake Lure! Room Comments: Gourmet Kitchen, Custom Cherry Cabinets, Granite Countertops, Double Convection Ovens, Steam Oven With Warming Drawer, 6 Burner Viking Gas Stove, All Stainless Appliances. Formal Dining Room. Butler&apos;s Pantry With Wet Bar, Wine Cooler & Wine Rack. Storage Space: Attic, Basement, Garage, Out Buildings W/Elec.